Tyler Breeze isn’t getting the best opportunities on the WWE main roster. Therefore, he threw out a pretty interesting challenge that a lot of fans would love to see go down. Now Velveteen Dream has something to say about Price Pretty’s challenge. Breeze wants to face Velveteen Dream for his NXT North American Title. NXT considered this a “dream match” when the posted about this social media challenge. Now The Dream is responding via his Instagram story. 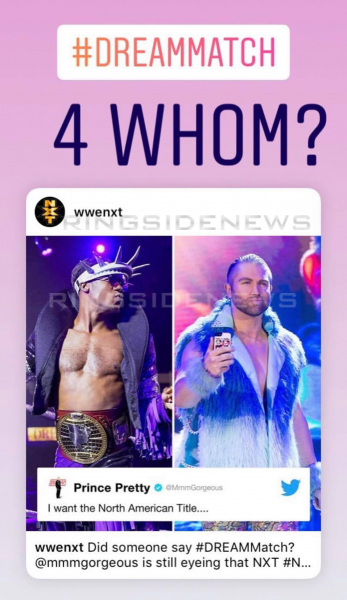 “4 whom?” Velveteen Dream wondered in an Instagram message. It doesn’t sound like he’s very open to the idea of putting his NXT North American Title on the line against the former FCW Heavyweight Champion. We will have to wait and see what goes down, but it is pretty hard to deny that Tyler Breeze might have an incredible run in NXT if WWE would send him back there for a spell and help refresh his character.